While they have yet to make big stars of Migo Adecer and Klea Pineda, the last two winners of “Starstruck” two years ago, GMA Network’s original reality-based artista search is all set to make its big and much-awaited television comeback this year. The pioneering talent search is ready to discover the next Ultimate Survivors as it once again opens its doors to aspirants across the archipelago. The nationwide auditions will be held on the following dates and venues: January 21 to February 15 (Mondays to Fridays) at the GMA Annex Building in Quezon City; January 26 at Centrio Ayala Mall in Cagayan de Oro City; January 27 at Robinsons Place Butuan in Butuan City; February 9 at SM City Legazpi and February 10 at SM City Naga in Naga City. Auditions will be from 10 a.m. to 6 p.m. Applicants must bring an original and photocopy of their birth certificate and two recent photos (one close-up and one full body). For hopefuls below 18 years old, he/she should also bring a certification, signed by a parent or legal guardian, that he/she is allowed to audition and a photocopy of the ID of the parent or legal guardian who signed it. It has been five years since Angel had her last primetime teleserye at the Kapamilya Network. All she did during those years were movies and guest stints in various ABS-CBN programs. The actress is making her much-awaited comeback on primetime via the highly-touted series “The General’s Daughter,” which starts airing on Monday, Jan. 21, on the Primetime Bida block. “The General’s Daughter” was among the four projects presented to Angel last year. It is going to be produced by Dreamscape Entertainment (which also produces FPJ’s “Ang Probinsyano”). The actress said she had been longing to work under Dreamscape and it was but natural for her to grab the opportunity to work with Mr. Deo Edrinal and his team. Since it is Angel’s primetime comeback, Dreamscape made sure they are offering something big in terms of production values and casting. There are numerous big scenes presented in the trailer, and more so are to be expected in the show, according to Manny Palo, one of the show’s directors. The Kapamilya network’s first salvo for 2019 has Angel playing the role of Rhian Bonifacio, the daughter of the respected military general who yearns for the love of her parents. She constantly proves herself to them to get the affection she deserves. Angel considers this role as one of the hardest she has done in a teleserye. “I have done several roles, and I must say this is one of the most complex characters I’ve played. It is hard. But it is also fun because I get to act with great actors, so I draw from them the proper emotions,” she said. “I think this is the right time to return to doing teleseryes. I think everyone I dream of working with is here. I am surrounded by my idols and the people I respect in the industry,” she added. The powerhouse cast of “The General’s Daughter” includes three generations of seasoned performers and award-winning thespians: Tirso Cruz III, Albert Martinez, Janice de Belen, Eula Valdez, the Diamond Star Ms. Maricel Soriano, Paolo Avelino, JC De Vera and Arjo Atayde. Also in the cast is the love team of Loisa Andalio and Ronnie Alonte. “I am excited to be back on primetime and to work with such a formidable cast. Some of them I am working for the first time and that adds up to the excitement,” said Angel. If Ms. Maricel praises your acting, there must be something in you that caught her attention. 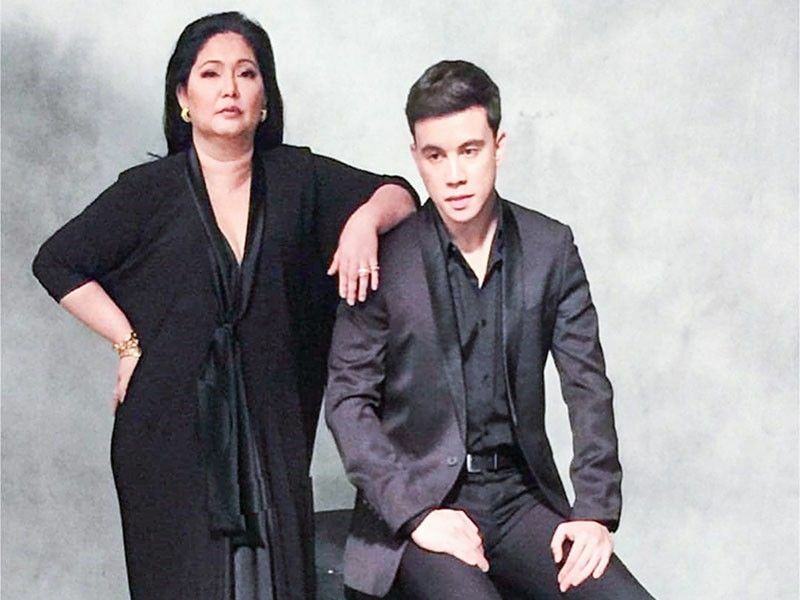 Arjo Atayde was speechless after the Diamond Star praised him to high heavens at the media conference of “The General’s Daughter.” He plays the autistic son of Maricel in the series and the veteran actress admitted being very impressed with his co-star.